Access Security Integrator is a feature-rich, integrated security management and access control system. It is intuitive and user-friendly with the power and flexibility to support larger, multi-site systems. Its advanced features make it ideal for more complex, high security applications that require integrated photo imaging and badge creation capabilities, Event Management, Alarm Monitoring, Email Response and more. ASI supports both the IC-1600 and UP-2000 hardware lines. Intuitive software – Colorful screen graphics, large icons and drag-and-drop time zones make this the most intuitive, easy-to-use software in the industry. Integrated control – Full ID badge creation capabilities, live photos for every cardholder transaction, alarm monitoring, CCTV and Email response are all included as standard features. Scalable – The client/server application supports over 1,000 card readers of all technologies, including proximity, biometric, mag-stripe, smart card, barium ferrite and more. 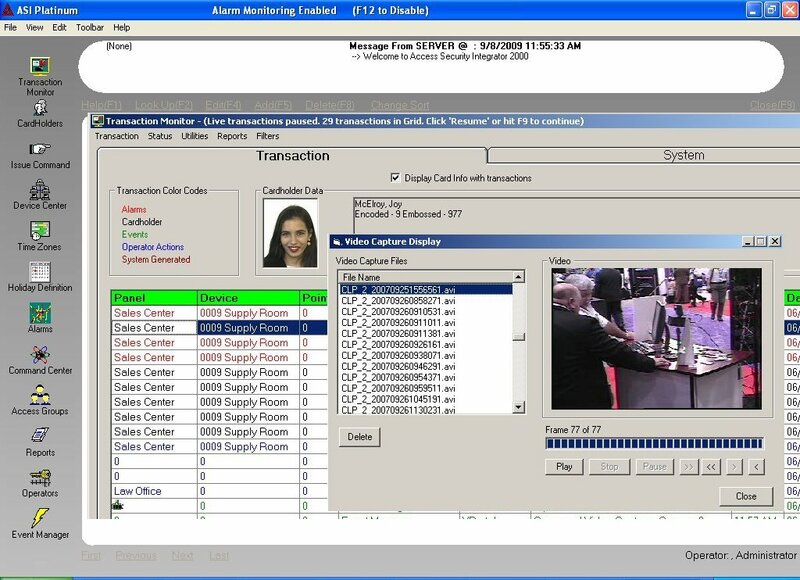 Digital video recording – Access control events such as specific access groups and cardholders at sensitive locations can trigger digital video recordings for playback within the Transaction Monitor. Automated Events – The ability to trigger outputs based on First In/Last Out, cross-pan el conditional response and event management make this system very powerful.